We can offer a single powered loudspeaker on a stand with a microphone and music playback facility such as CD or iPod / Laptop lead through to a multiple loudspeaker system depending on the size of venue or number of rooms you wish to have speech or music relayed. StageGear has worked with many corporate companies to provide PA systems for Conferences and Awards events, and these can include question and answer sessions with a panel opf people. 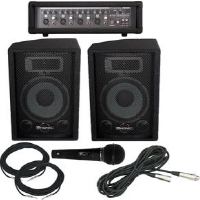 These systems often include AV systems with radio microphones, music playback facility such as CD or iPod / Laptop lead* through to a multiple loudspeaker system depending on the size of venue or number of rooms you wish to have speech or music relayed. 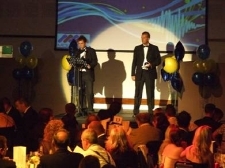 StageGear can provide technical equipment for your awards event, from the PA system to Presentation projection. The evening can be enhanced with a Theme and even Special effects to make that special event to remember. StageGear Technicians can run the technical equipment for the event, so you can feel at ease to mingle and enjoy the event. If it's a product launch you wish to hold, then StageGear can assist with a PA system, Lighting system and special effects to give your product launch the right impression. StageGear offers a wide range of props and equipment for your themed event, whether its a party, wedding or corporate function we have the answers. As well as theming the venue we can supply the techncial equipment for your choice of entertainment and lighting and special effects systems to ensure a fantastic event.